Newer half duplex home with wide open views of the Gulf with heated private POOL - perfect for three couples or a family. Fabulous views of the open water from home and decks. Relax on the living room deck overlooking the pool and Gulf, a great spot to toast the sunset. The master bedroom on the 3rd level has panoramic views of the bridge and open water. The cut in boat basin is perfect for most boating needs. Ladder access to the water for ease of swimming or take out our complementary 2-Person sit-on-top kayak to explore the local waters. Want freshwater swimming instead? You can't beat the unit's private swimming pool as a great spot to cool off and enjoy the open water views - 3 outdoor decks plus a waterfront pool patio and grill great to relax. Tile floors throughout, carpeted bedrooms with private bathrooms with roman tub showers. Beautiful kitchen, stainless appliances and all the cookware and dinnerware for that special dinner. Boat slip for boats 30' or less and less than 10' beam. Trailer parking onsite. Fish or Swim right from dock for tarpon and snapper. If you're looking for that spectacular Sunset View - you've found the right property. From the patio, the pool, from the living, the kitchen, the decks, the bedroom - this 3 story home has a spectacular water view from every point of this property. Protected cut-in dock provide a great spot for your boat. New pilings, fresh water wash down, fish cleaning table. Easy access to Gulf or Oceanside via the 7-mile bridge or Vaca Cut. This cut-in dock will accommodates less than 30' in length and with less than a 10' beam. Vehicle and Trailer parking onsite and nearby boat ramps. Sick of showing up to find that those beautiful pictures were taken 20 years ago. Beautiful modern new 3 story home - super cool. All new furnishings, beds/mattresses, living room furniture. Flat Screen TV through-out, high-speed wireless internet, cable. Like to cook: enjoy this beautiful well stock kitchen for that special dinner with loved ones and friends. Avid fisherman, diver, amateur hockey player, husband and dad. I fell in love with this home the moment I drove up to it. We only buy vacation homes that meet these 3 criteria: View, boatablility/dock, and comfort. This home has has all 3 in a big way. This is just a very relaxing home with incredible view in a quiet location with the best view you could ask for. Boat, kayak, fish, snorkel or dive right from the patio. Walking distance to two of my favorite restaurant/bars - The Sunset Grille and Lazy Days. 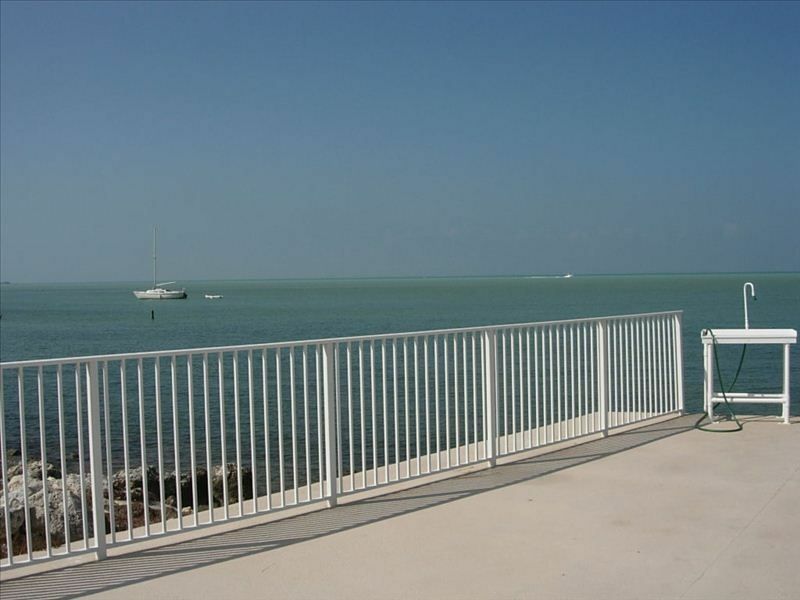 Choice to relax by the private pool or run the 7-Mile bridge. It has something for every family members desires. A nice place to vacation. We had 3 couples of older friends who enjoyed sitting and drinking wine to the sunsets. Great views! Well placed for restaurants, beaches, etc. Manager is very helpful and friendly. Gladly recommend it. We loved it, and we'll be back!! This was our first stay in this home, and we can't wait to return! Four of the six people in our group had never been to the Keys or rented a vacation home before. They now say they are spoiled for future trips and any future places will have to be as nice as this one! The owners, Joe and Mary, responded in a timely manner to emailed questions about the house. The renting process was very easy and stress free. The check in/check out process was easy to follow. The property manager, Debbie, was immediately available for the few questions we had while we were in the home. Outdoors: The gas grill was put to good use nearly every day. We loved eating every meal out on the main floor balcony, looking at the great view/ listening to the water. Even though we didn't bring our boat, the guys loved fishing off of the dock. There is plenty of space for a boat, and the fish cleaning station and the bait freezer got a workout while we were there because the mangrove snapper and tarpon were really biting most of the week. We only took the double kayak out a few times because it was really windy, but it was so nice to not have to bring ours down with us. The small island off to the right is good little jaunt and great for bird watching. We brought extra bikes to go along with the two that were provided so all 6 of us could ride. The pool although on the small side (most are in the Keys) was perfect for sitting and chatting with friends. We had a lot of wildlife visiting us, too. A large iguana, a huge land crab, fish, baby sharks (caught and released at night), a manatee swimming by, and lots of birds. I rode my bike to the grocery and fish market! Did I mention the VIEW..and the stars at night..and the breezes?! Inside: The house is well stocked and very functional. The downstairs entry is great for storing all of your gear that doesn't need to go upstairs, like fishing gear, bikes, extra water, etc. There is ample closet space throughout. The washer and dryer are nice to have. The main living area is smallish, but we were rarely in the house. The bedrooms were all a nice size and the whole house is tastefully decorated. The pictures online are up-to-date, so no arriving and seeing 30 year old furniture.It is a nice layout with basically two master suites on the top floor and a full bath and bedroom on the main living floor. Florida is hot and the A/C in this place is great when you want/need to be inside. Great TV. THANK YOU!! WE'LL BE BACK!! We are repeat guests; this was our 5th year at this property. Prior to this house we stayed at a different location in Marathon each year, enjoying our time but not quite what we were looking for. This spot is perfect for those who plan on spending a good deal of time in the water. You have the Gulf in the back and the Atlantic just minutes away, the best of both. The sunsets are amazing! Even the days we had stormy, overcast weather the sky was picture perfect. We are able to pull right up to the house, unload our gear, clean fish & lobster and relax in the pool. My tip – bring a canopy to put over the pool, you will be surprised how much cooler the water is (remember its south Florida). Any issues we have had are always taken care of promptly. After a long hot day, I have to say the a/c is better than my own home! We have made use of the bikes (the path to the Old Seven is a great ride – watch out for big Iguanas, but it’s closed for refurbishing) and the kayak (go left and into the little cove before the island for a calm paddle). For the best Key Lime pie check out Seven Mile Grill – we walk, it is right on the corner. For the best meal go to Lazy Day’s South – just across US1, bring your catch and ask for the Lazy Days way. I have tried to visit so many spots on Marathon, with a camera, and would say my favorite was a helicopter tour. We actually flew right over the property. For the past 4 years we have had an octopus outside at night, a pretty blue, and this year while looking for it a 7ft nurse shark came all the way in the boat slip. It was a first for me to not have my camera and I missed it. My first review was 2012 and I decided not to read it before writing this, I just did and realized I said most of the same things. Thanks Cher. Always good to see you back each year. We normally stay on at the Brian Rd Tiki home and finally had a chance to stay on 12th St. Gulf for two weeks in March. It's a completely different experience with being able to walk to the our favorite eateries and the 7 Mile Bridge. and the convenience of this location for fishing the Atlantic side. We returned this year to Marathon, our second stay at this house. Our kids loved it so much last year, they started a vacation countdown 11 months before our departure this year. Our inlaws rented the other half of the duplex again (through a different owner) and two other families joined us, staying at other resorts without a private pool! Guess where everyone hung out? The location of this house is perfect, with quick drives to grocery stores and restaurants (with a couple within walking distance), and just an hour further to Key West. Having a private pool, boat dock, fishing poles, and a kayak provided us with plenty to do between excursions. A/C works well, beds are comfy, and the kitchen is fully stocked, plus there's a gas grill and an outside chest freezer. The local manager is easily reachable and the owners are experienced renters. Couldn't have asked for a better vacation! It was in a good location, however, we found it to be a townhouse not a home. The owner, by phone because he lives in a different state, kept telling me that it looks just like the pictures. If you look at the picture of the home you will not see the 2 addresses on the back which made it look like we were renting a whole house. The 4 adults that were staying there felt it was definitely overpriced for what we received. The furniture was very well worn and one of our husbands used a zip tie to shore up the middle leg of the sofa in the living area so no one could fall through again. The pool is very small and in need of attention. The lawn furniture also was rather iffy to sit on and one left plastic chaise lounger was cracked beyond repair. We were suppose to arrive to an unlocked house but it was not unlocked and an hour later we finally received a call back from the woman who is taking care of the house and a male brought us the key. The guest bedroom upstairs had two windows which wouldn't open and our master bedroom screen to the balcony was falling apart and fell off when we opened it. The refrigerator was a high end item but was repaired on the door, apparently by another renter, very badly. Now for the real story. First, this is our most popular home – 50% of our current bookings are from returning guests. We have 25 reviews most 5 STAR and the remaining 4 STAR. We aren’t going to get so many return renters if he house was over-priced or in bad condition. We’ve been renting this half duplex home since 2011 – half-duplex is stated in the description of the home, in the agreement, quotes. As you read more of my response you can come to your own conclusion. The guest went to the wrong home, in the wrong city, 10 miles away – not following the provided directions. She left me a message that the home was “occupied” and 15 minutes later an irate message that she was calling “the sheriff” among other things. She then called my property manager, Debbie, and was very rude to her. When the guest arrived the home was locked because she had not arrived at the indicated time – we had it unlocked within 15 mins. The pool service was servicing the pool and she demanded that the pool heat be turned on, instructing them that she paid for it, which was not the case. I spoke to the customer about an hour after her arrival. She wasn’t very nice and insisted that we gave her the wrong directions. No apology for her messages after I explain that we’d been using the same directions for years. The story doesn’t end here. When we arrived for our vacation 2 weeks later I noticed that someone put zip ties on the frame of the couch. The couch was broken beyond repair so we replaced it. She writes this bad review 2 months after her stay calling out the couch repair they did. I don’t know about you but if I stayed in a home and the couch broke, I’d get a message into the property manager or owner, not cover it up. For the record, we wouldn’t’ have charged them for this damage due to normal wear and tear. What I can tell you about our home is that while a half-duplex, the two homes are fenced off from one another. Each side has its own pool, kayak, seating area, dock space. To the opposite side, it’s all green space along the shore. The street only has 7 homes on it – very quiet – and the views are incredible. The home is also 12 years old – one of the newer homes in Marathon - and very well furnished and equipped for longer stays. I’m confident that we deliver an incredible value to our guests. This statement is reinforced by our full calendar, that 50% of guests are returning guests, and by the 24 great reviews on VRBO. Our family of six stayed here and had a beautiful week. Sunset views from the top deck each evening were spectacular. We enjoyed walking/biking to the Seven Mile bridge. Easy trip to Key West and to the Upper Keys. The house was comfortable and well equipped. The owner was responsive when we contacted him. I'd love to visit again. My husband loved fishing from the dock. I'd take this over a crowded resort any day.